The conference is free and open to the public. Non-presenters who wish to eat must pre-register here by February 25. Detailed presentation schedule now available here. 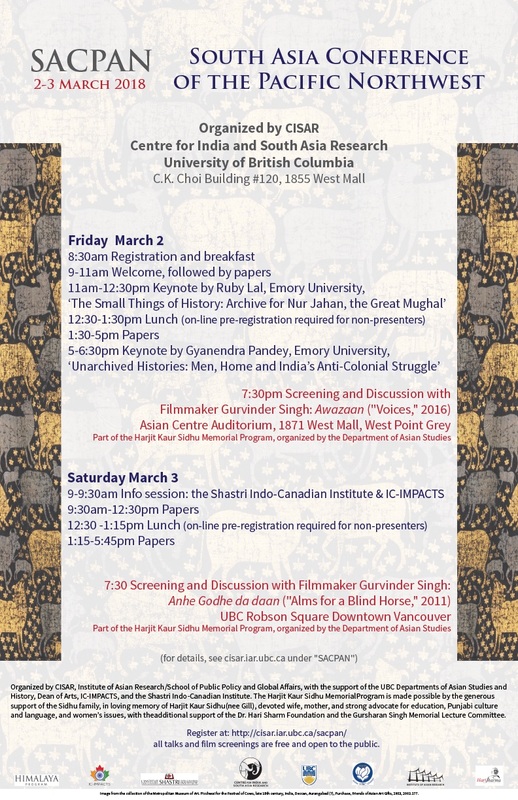 Organized by CISAR, Institute of Asian Research/School of Public Policy and Global Affairs, with the support of the UBC Departments of Asian Studies and History, Dean of Arts, IC-IMPACTS, and the Shastri Indo-Canadian Institute. The Harjit Kaur Sidhu Memorial Program is made possible by the generous support of the Sidhu family, in loving memory of Harjit Kaur Sidhu (nee Gill), devoted wife, mother, and strong advocate for education, Punjabi culture and language, and women’s issues, with the additional support of the Dr. Hari Sharma Foundation and the Gursharan Singh Memorial Lecture Committee.